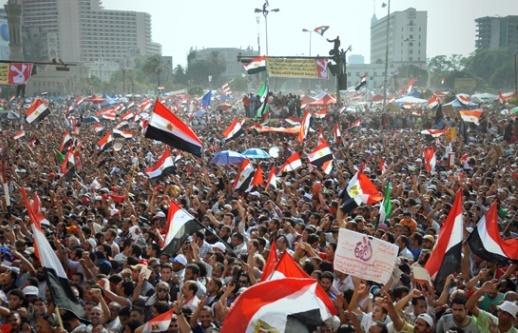 Muslim Brotherhood supporters gather in Tahrir Square to celebrate the electoral victory of Mohamed Morsi on June 24, 2012. The priest of an Egyptian church attacked last week says his church was targeted as part of a wider pattern of retribution from Muslim Brotherhood supporters against churches and security forces following the overthrow of Mohamed Morsi last summer. Around 70 churches were attacked last summer in retaliation against the dispersal of protest camps set up in the wake of Morsi’s deposal. Many Muslim Brotherhood members hold Christians at least partly responsible for the overthrow, especially following comments made in support of the army by Coptic Church leader Pope Tawadros II. In the latest attack on a church, a policeman was killed and two others injured* when the Church of the Virgin Mary in the 6th of October Diocese came under fire on Jan. 28. Father Morcos Joachim told World Watch Monitor that the attackers were seeking to avenge the recent arrest of many members of the Muslim Brotherhood. “They targeted the security forces to seek revenge for the arrest of many Muslim Brotherhood members and also they targeted the church for inciting the sectarian strife between Muslims and Christians,” he said. The priest said he suspects the attack on the police was a response to the arrest of many Muslim Brotherhood members at a Jan. 25 march in the 10th District of the 6th of October city, west of Cairo. “The police arrested many of them at the march, so what happened on Tuesday was their backlash,” he said. The priest said the assailants were chased away by local residents, who shot and injured one of them, 30-year-old Mohamed Abdel-Raman. He was later arrested, along with two other suspects, Mohamed Abdel-Hamid Ibrahim and 29-year-old Abu Anas. The fourth suspect’s identity has yet to be released. Fr. Joachim said the number of policemen outside the church has increased since the attack. A church member added that Muslim residents had joined with Christians in chasing after the attackers in the aftermath of the shooting. *Update (Feb 5): One of the injured men, Mina Emad Anwar, 28, has since died from his injuries. The Egyptian Interior Ministry has posted a video clip of what it says is the confession of one of the defendants, in which he states: “I was trying to do something for God’s sake against the infidels, army and the police”.